We conduct Estate Sales and downsizings sales in the Tulsa, Oklahoma area. 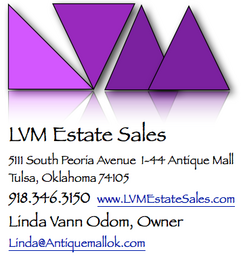 Linda Vann Odom and her great staff work together to make the most of your valuables. I-44 Antique Mall and has sold online since 1999.
their sales, with thousands of clients on their e-mail list.